Join the Band is where musicians of all ages come together. The 50th Join the Band concert takes place on Sunday, October 15, 2006 – the Halloween Concert – from 10am to 5pm at the Knitting Factory Hollywood. 7021 Hollywood Boulevard. Close to 80 teenage and adult musicians, some in costume will play in 20 bands all day. Admission is $5.00 kids under 17, free and food is served all day. 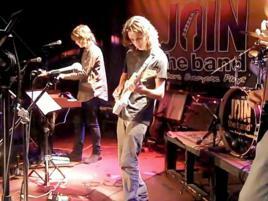 Over 500 musicians have performed 750 songs in 567 bands. Everything is played – from Spinal Tap to Charlie Parker to the Beatles. Join the Band’s founder John Mizenko, groups practicing musicians for seven weeks and place them in rock, blues, and jazz bands the goes public the eighth week in highly anticipated performances. “Kids need a safe and secure outlet to perform,” says one of the Valley moms. Join the Band provides a supervised atmosphere that’s still got the cool factor. Kids learn to read charts, music theory, how to play with others in a give and take cooperative learning environment. Private instrument lessons are offered in soundproof practice rooms. All equipment is provided. Students only have to bring their own instruments – except drummers. Drums, amplifiers, and microphones are provided as well as charts that Mizenko creates along with recordings of the songs. In addition to guitar, bass, drums, keyboards and vocals, Join the Band members have also performed on saxophone, trumpet, harmonica, and many other instruments..
Join the Band offers private music lessons, workshops, and classes including music theory, soloing, and rhythm. Its fully equipped studios and practice rooms are also available for rent. Winter Session begins October 23, 2006 and registration fills up early. The next concert at the Knitting Factory-Hollywood, “Holiday Jam” is December 10, 2006 from 10am to 5pm. 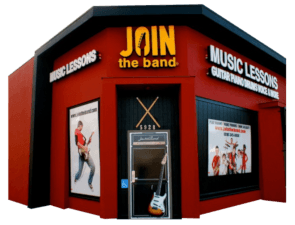 For over 20 YEARS Join the Band has been offering music lessons and band programs to the Sherman Oaks community of Los Angeles.